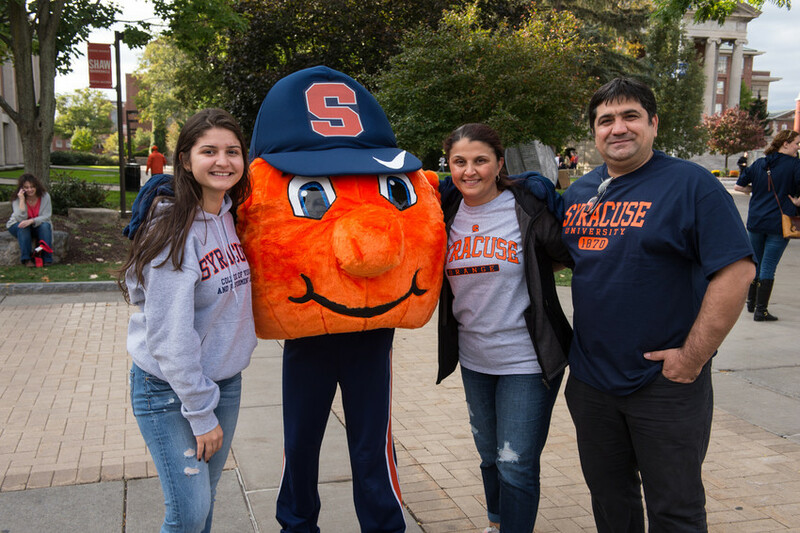 Friday, Oct. 26, through Sunday, Oct. 28, family members will join the Syracuse University community to participate in Family Weekend 2018. Attendees will be traveling from across the world to celebrate the weekend with students. Families will have the opportunity to participate in a number of exciting events coordinated by Parent and Family Services within the Division of Enrollment and the Student Experience. With events throughout the whole weekend, families are invited to the Family Weekend Welcome for the official kickoff. At the welcome, Chancellor Kent Syverud and Robert Hradsky, senior associate vice president of the student experience and dean of students, will speak about Syracuse University initiatives focusing on students’ academic and outside the classroom experience. The event is from 4:30-5:15 p.m. today in Hendricks Chapel. In addition to the welcome, families are invited to attend sessions and events throughout the day today. Sessions include information on student employment, living off-campus, the Center for Learning and Student Success (CLASS) and much more. Families are also invited to attend one of the many events happening on campus, including meditation sessions, athletics events, a hypnotist presentation and movie screening. The family fun continues on Saturday, Oct. 27. Beginning the day with deans’ breakfasts, and ending the day with a Family Weekend Glow Skate, Saturday brings many opportunities for families to engage with a variety of offices on campus to learn more about the student experience. Families headed to the game on Saturday are invited to attend activities on the Shaw Quad beforehand at 4 p.m. Be sure to bring the energy to the Carrier Dome to cheer on the Orange as the football team takes on the North Carolina State Wolfpack at 7 p.m. Visit cuse.com for ticket information or call the Carrier Dome Box Office at 315.443.2121. For the full schedule of this weekend’s activities, visit the Family Weekend Guidebook. A printable version of the schedule is also available.